We always get a kick out of how fans keep finding new ways to use JibJab Starring Yous. With Monster Mash this month, we’ve seen folks apply the technology into some new situations that were so awesome we had to share. The Arizona Orthadontic Studio outside of Pheonix is running an all-orthadontist Monster Mash in their waiting room through this month. Popular pop-rocker Hawk Nelson also used the mash to promote their new album. We’re hearing about more Monster Mashes daily, including pet talk radio shows, college sports blogs and featuring the staff of Myrtle Beach’s O.D. Pavilion amusement park. Doing something original with your Monster Mash videos? Let us know and we’ll spread the word! I am attaching a photo of our staff and myself (Dr Feldman) in our waiting room. 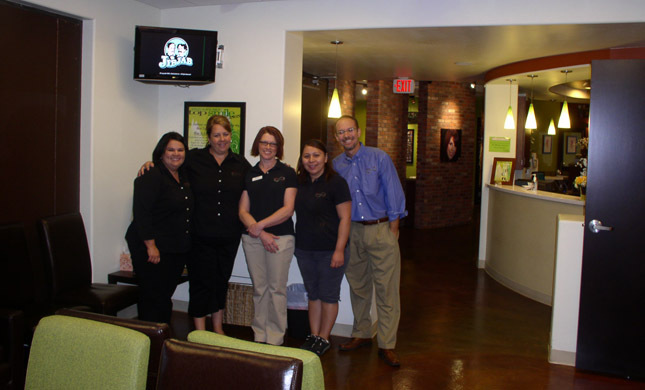 We normally show informational videos about orthodontics and dental care. BUT, when we found Jibjab, we created several videos of the staff ‘in action.’ Patients love watching their doctor and assistants rocking out in the Monster Mash. Perfect for the month of October. Looking forward to more great work from Jibjab. This entry was written by paulhanges and posted on October 22, 2009 at 4:25 pm and filed under Fans, Fun with the Site, Monster Mash. Bookmark the permalink. Follow any comments here with the RSS feed for this post. Trackbacks are closed, but you can post a comment.